Giovanni di Pier Matteo Boccati was born in Camerino in The Marches around 1420. In 1445 he became a citizen of Perugia. It is thought that he died after 1480, the year when his presence is recorded in that city receiving payment for two altarpieces. Boccati lived and worked in Camerino, Padua, Perugia and Urbino. His first documented work is the Madonna del Pergolato in the Galleria Nazionale dell’Umbria in Perugia, of 1447. 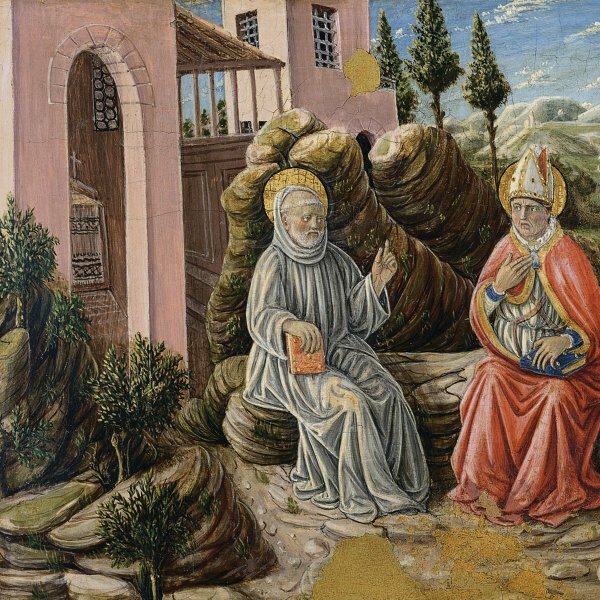 His style combined the influences of leading painters of the day such as Fra Angelico and Filippo Lippi, along with that of Domenico Veneziano during that artist’s period in Perugia, where Boccati seems to have trained. The Madonna dell’Orchestra (Perugia, Galleria Nazionale dell’Umbria) reflects the innovative spirit that prevailed in Paduan art at that period due to the presence of leading artists who introduced Renaissance ideas. This context left a permanent mark on Boccati’s work, which reveals an evident interest in naturalism and perspective as well as in a new treatment of light. These features are also to be detected in the fresco that he painted in the Palazzo Ducale in Urbino, with its largescale figures and a clear sense of monumentality. In his late works, such as the Orvieto Altarpiece of 1473 and The Pietà (Perugia, Galleria Nazionale dell’Umbria) of 1479, Boccati used a softer, more serene style with less monumental, more uniform images and a more linear handling of the drapery, although his distinctive treatment of light and his sense of lyricism are still to be seen. Despite not being a pioneering painter, Boccati assimilated the artistic innovations of his day, adapting them to his own manner.